Want to know more about our KEG FRIDGE DEAL? Fill out your details and we will be in touch. Laughing Lizard Brewing. 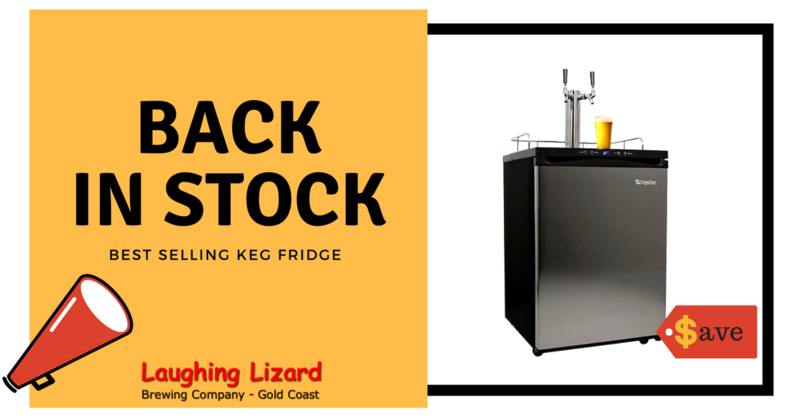 Our most popular KEG FRIDGES – now Cheaper than ever. Best value package deal in Australia. Compare the pair as they say. UP TO THREE BRAND NEW 19L KEGS – TO KEEP!!! Choose the number of kegs. Gas Bottle Full Of CO2 Gas. We Have All The Beer And Gas Connections To Get You Ready. 2 Headmaster Beer Glasses To Get You Started. As a bonus for buying a Keg fridge package deal from us, we will fill your kegs with any of our beers that you choose for FREE. You can have different types if you wish. There are also upgrades available for the very popular Cobra Tower. These are a commercial quality tower. The advantage of buying from Laughing Lizard Brewing is you are backing a local! We are a family business (2 brothers) that has been in operation for over 10 years. We guarantee that we will honour the warranty. You won’t have to deal with some faceless person over the internet. We stock a full selection of all the parts and have a good deal of knowledge about the workings of the fridges. We’re a one-stop shop. We fill gas bottles here. We can even sort out your BBQ gas bottle while you’re here.